This essay by Eric D. Wanger was originally published in a newsletter for the financial clients of the multifamily office he ran in Chicago. In a world of negative interest rates, the risk premium—the basic principle in finance that bigger risks should command bigger rewards—is back in the spotlight. I’m a die-hard Fermilab fan when it comes to world-class atom smashers. For a while I cheered for the Stanford Linear Accelerator, but then I moved back to Chicago. Right now, all the buzz is centered on the Large Hadron Collider in Europe. (I’ve been to Europe. I suggest Epcot Center instead. It’s closer and the bathrooms are cleaner.) The search for advanced particles may make you want to nap. But particle physics involves a surprising amount of risk, danger and injury. 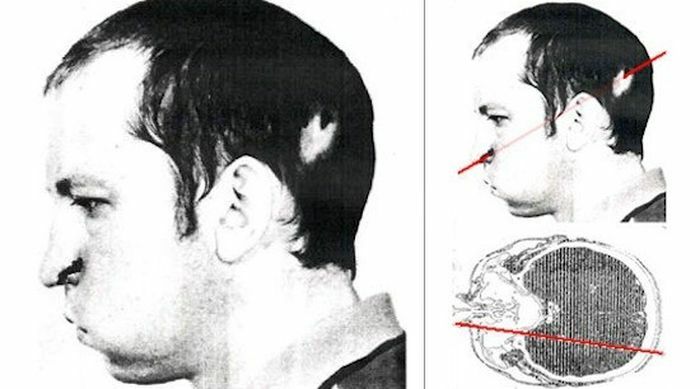 The hero in this story took a proton beam in the face and lived to tell about it. Everything in life involves taking risks. Finance is no different. But in finance, unlike other realms, risk is supposed to have a value that can be priced. In finance, folks expect compensation for the risks they take and expect to pay for the risks they put on others. This is the basic principle behind risk premiums. Bigger risks should command bigger rewards. Risk and reward don’t have to be measured in money, or even in numbers, for the principle to hold true. However, it’s easier to think about it that way. This makes common sense: If you compare two different investments promising the same financial returns, it makes sense to choose the least risky of the two. Like most finance principles, it’s not an exact science. It works best on average and over time. But investors should always know the risks they are taking and the premium—or spread—they are receiving for taking those risks. Bugorski had a hole bored in his head by a tiny but powerful beam of atomic matter. Nobody, especially his comrades, were able to figure out why he lived. The beam passed straight through his face, skull, skin and brain without killing him. We all know that taking risks is a part of life, and Bugorski was no dummy. Even so, he had no idea that he was getting paid to take a face full of quarks and gluons. He undoubtedly had a sense of Soviet workplace safety standards, but probably hadn’t considered he was betting his life on them. As it turned out, he was a lucky man. According to journalists, Bugorski eventually developed seizures as a result of his injuries, but in the main, he could work. The Soviet health care system, of course, denied him the medicine he needed. Despite all this, the man continued working on his research projects in Protvino, one of the bankrupt little Soviet science towns that remain odd relics of the Cold War. Over the last 10 years, many stock market investors have felt like they’ve had holes burned in their heads. They are not too far wrong. A buy-and-hold investor received no reward for investing in stocks for much of the last decade. In fact, if you bought the stocks of the S&P 500 (an index of 500 of the biggest U.S. companies) in January 2000 and left your money in for 12 years, you lost money. This goes against traditional financial logic that says that over material periods of time, investors should expect to receive compensation for the extra risks they take by investing in stocks—equities—as opposed to investing in bonds. This is called the equity risk premium. Over the last decade, the equity risk premium was essentially nil. Unless one had superb timing based on a superb crystal ball, the S&P returned about the same as the 10-year Treasury note (3% to 4%), or even less. Over the last decade, a stock investor did not get paid to take the extra risk in owning stocks. 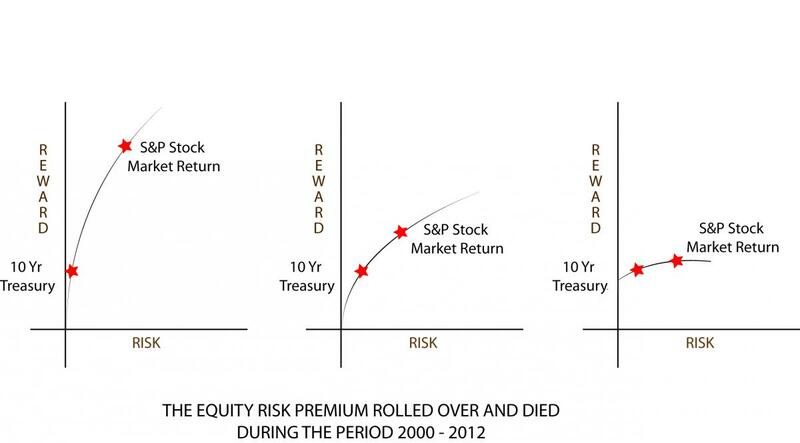 The equity risk premium is a textbook finance concept that tries to quantify these ideas. It refers to the amount of additional investment return an equity-like bundle of risks should provide over a similarly situated bond-like bundle of risks. The point is more dramatic if one uses the proverbial risk-free rate of return as the basis for the comparison. The risk-free rate used to be equated with U.S. government bonds, often the 10-year Treasury. I’m not so sure any more. What Should the Equity Risk Premium Be? Between 1926-1997, stocks returned an average total of about 7.7%. Between 1926-1997, bonds returned an average of about 2.4%. That means that in rough numbers the equity risk premium averaged 5.3% for that approximate 70-year period. Compare this to the last 10 to 20 years: During the 1990s the equity risk premium dropped consistently below 2%. During the decade of the year 2000, it flat-lined. Why did equities perform so badly during this period? 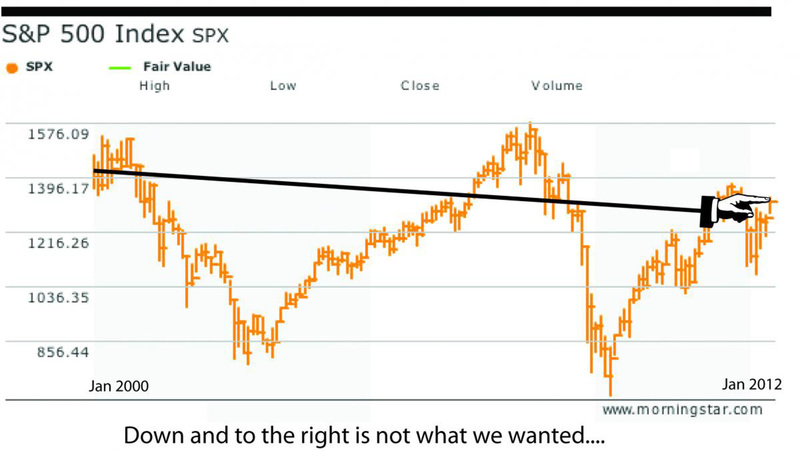 There are many ways to interpret the data, but I believe that Wall Street was able to get people to forget what stocks actually were. People became willing to pay too much for them. If people pay too much for an asset, their returns will—by definition—be poor. Like any kind of security, stocks represent a bundle of legal rights purchased by an investor. In the case of most common stocks, these rights represent a portion of corporate ownership, the right to vote as a shareholder, and the right to receive dividends. But during the heyday of the 1990s and the 2000s, investors became mesmerized by the huge sums they could make when big companies gobbled up other companies in exchange for megabucks. This was at the height of the dot-com boom as well as the takeover boom of the mid-2000s. Blinded by the huge numbers touted by the financial media and Wall Street, too many investors ignored the mundane realities of net income and cash flow, ignored dilution by insider stock options and new share issuance, and ignored managements with a disdain for dividends. Investors preferred instead to drive revenues, non-GAAP earnings and “EBITDA.” For a variety of reasons, too many stocks spent a significant period of the 1990s and the first half of the 2000s overvalued and overhyped, meaning that investors paid way too much for risks they took. Does that mean it was impossible to make money investing in stocks during the last decade? No, it does not. It means that it has been a stock picker’s market and even a trader’s market, rewarding folks that bought cheap and sold dear rather than blindly buying and holding forever. It required making sure that one got paid for the risk one was taking. This rewarded folks that took advantage of buying opportunities when prices were too good to pass up or bought shares in firms that paid dividends. Of course, there were plenty of “take-outs” during that period as well. Everyone has a story about a company purchased by Microsoft, Oracle, Google or Apple. But in the end, risk only gets rewarded if people properly price the risk they are buying and selling. Anatoli Bugorski showed that often we take risks we can’t imagine and that risk is not always properly rewarded. He also showed us the toughness that human beings can display. Ralph Wanger has pointed out that the return on certain asset classes such as stocks can be lousy for long periods of time. I’ve gone to his speeches on the subject. They make a lot of sense. Risk premiums do revert to the mean, but the cycles seem to be extremely long, often lasting more than a decade. Investors may need the fortitude of Comrade Bugorski while they wait.